This is a Christmas morning tradition in our household: I make the monkey bread, and mom makes the breakfast casserole. Both can be made the day before, and then popped into the oven while the family is opening presents. 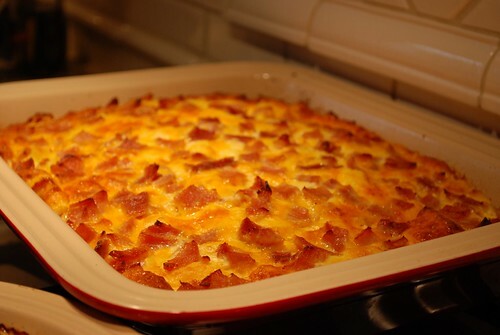 Mom’s strata is sooooo delicious, and not too greasy or heavy like the recipes I’ve seen that use crescent rolls. 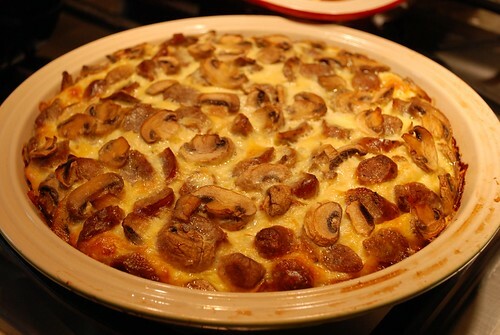 It puffs up and browns beautifully, and it heats up well the next day if you have leftovers! The other great thing about this recipes is that you can customize the combination of ingredients to any taste – we’ve even made it vegetarian a few times. We like ham with tomatoes and swiss cheese. 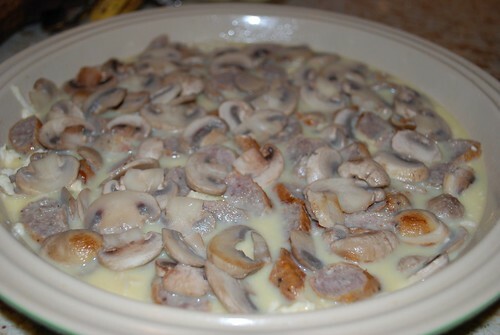 We like sausage with cheddar and mushrooms. We like bacon with anything! You could make it “Mexican” by adding a can of green chilies, drained, using some chorizo sausage and using a Mexican cheese blend and salsa. You could make it “Italian” with some Italian seasoning, an Italian cheese blend, and chopped up Roma tomatoes. 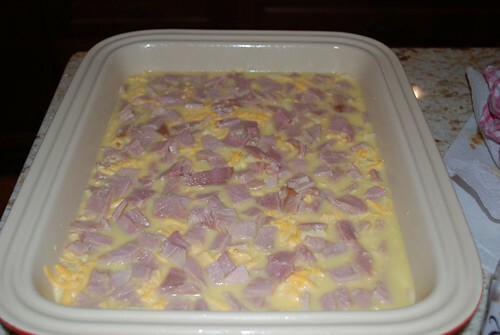 You can make it “Southern” by making it with sausage or country ham and serving it with biscuits and gravy. It’s very versatile and, most importantly, extremely easy and delicious! I hope you enjoy this brunch treat! Grease a 9″ x 13″ pan. Arrange bread cubes in pan and sprinkle with cheese. In a large bowl, beat eggs, milk, salt, pepper and mustard with a whisk. Pour egg mixture evenly over bread and cheese layer. Sprinkle with meat and vegetables. Cover and refrigerate overnight. 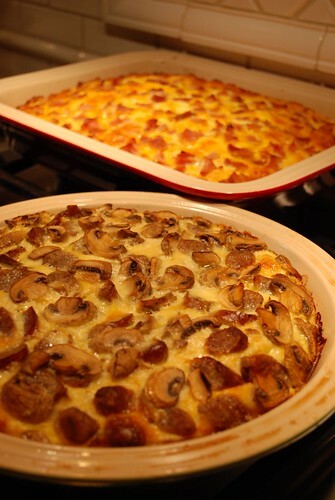 Preheat oven to 325 degrees and bake strata uncovered until eggs set in the center, about 1 hour. Cover loosely with foil (sprayed with Pam) if top browns too quickly.